Employees — Billy Goat Bicycle Co.
About us at Billy Goat Bicycle Co.
We’re a fun, creative, and unique team of bike enthusiasts that love what we do. Our shop was started by two brothers who have made bicycles their life. We’re here to serve anyone and any bike in our community. To us this isn’t a job, it’s a passion. Dirk has been working in the local St. Louis Cycling scene for the past 25 years. He started racing road bikes at 14, at which point the love affair with bikes began. By the time he was 18, he was working at one of the area's premier bike shops. The experience that he gained over the next 20 plus years has given him a tremendous amount of hands-on experience. From custom bike fitting, bicycle mechanics, merchandise selection, to managing a multi-store shop, Dirk’s done it, and if he doesn’t know the answer, he always seems to have a connection to the source for the answer. His deep love of the culture of cycling has also turned him into a bit of a bike collector. If you like old vintage bikes, ex-professional team bikes, vintage cycling gear, or old cycling magazines, you should come by and see some of the collection. From his first few days of working in the bicycle industry, he remained hooked, and it was always his goal to open his own store. With his brother and business partner, Sven Sprogoe, they are proud to run Billy Goat Bicycle Company. Their integrity, honesty, and commitment to being involved in the local St. Louis cycling scene is the foundation of what the store is built on. Sven has been racing his bike since he was 15 years old. Both he and Dirk shared a love for the speed, the independence, and the competition that bicycles gave them. They weren’t just brothers; they were teammates, training partners, and best friends. 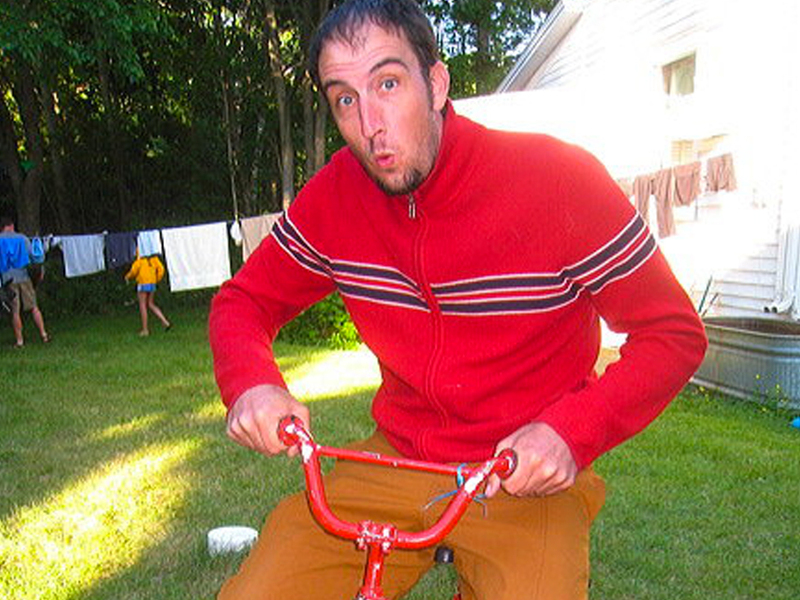 Sven spent nearly eight years working bicycle retail while racing and finishing college. He’s been active in the St. Louis cycling community ever since. He’s built a reputation amongst other racers as a strong, smooth, smart, and extremely competitive racer. Bicycles have always been a part of his life, and the dream to one day own a shop, was one that he approached with the same tenacity that he relies on when he races. His interest goes beyond just racing and race bikes, he’s got four girls and a wife that have all taken to riding bikes for fun and fitness. Billy Goat Bicycle Company is the result of Sven’s steadfast pursuit of his goals. Dave is one of the friendliest people you will ever meet. The person that came up with the quote, “Don’t trust anyone with a beard,” clearly had ever met Dave before. Dave gets excited about every facet of cycling, whether loaded down bike touring, European road racing, and especially cyclocross. He’s been in the bicycle business for the past ten years, and there isn’t much that he can’t tackle on his own. Dave spent his younger days with competitive swimming. Perhaps after too much chlorine or too many laps in the pool, he decided to hang up the Speedo and put on the Spandex. It didn’t take too long and the bike bug bit Dave and he’s never looked back. There isn’t much that Dave likes more than bikes, other than perhaps his wife, his furry babies, and a delicious beer..
Josh is truly our “Josh of all Trades.” He wears many hats here at the shop and plays a huge part in sales, service, computer maintenance, web design, and keeping us old guys in the loop. We're pretty sure that Josh may have been a chameleon in another life, because he can move from hipster to road racer, to tri guy, to avid commuter guy, and he looks right at home in every one of those. Josh is clearly one smart cookie, and if there is one thing that we love here at the Goat, it’s COOKIES. Trust us; you’ll love Josh just as much as a home-made chocolate chip cookie. Zach only works for us on Saturdays, but his knowledge and experience seems to carry us for a full weeks worth. He’s our go-to mountain bike expert, be it front suspension, rear suspension, or even electronic mountain gear systems, Zach is our guy. His stable of bikes makes us all a little envious, but he makes sure not to flaunt that too much. You are probably more likely to see Zach out on the local trails, but if he's the guy that put your bike together, you can be sure that you’ll be enjoying the trail also. Until the day that we can have a Shop Goat at the store, we'll have to make do with these super rad pups. They aren't always at the shop, but if they are, you should certainly say hello.